For the latest installment of Healuxe Beauty introductions, I want to introduce you guys to a truly stunning brand of small-batch, all natural products made with love in New Mexico. Plantfolk Apothecary is truly one of the best brands I've ever discovered, with beautiful ingredients, packaging and effective results to boot. I've been trialling a few different products from the line for about a month now, and in that time I've seen such beautiful results that it's only solidified my love for the line and made me even more excited to be able to share it with you all at Healuxe Beauty. First up let's talk a bit about the brand's Petal Powder Cleanser + Mask*, a blend of hibiscus, rose and lavender that acts as both a cleanser and mask (which you might have gathered from the title). I've used masks with hibiscus before and have truly found it to be one of the most rejuvenating ingredients - it increases blood flow and is full of antioxidants that are just wonderful for your skin. As both a mask and cleanser, all you need to do is add a bit of the mixture to a bit of water and spread it evenly around your face. For a cleanser, you just can wash it off with warm water or, for a deeper cleanse, you can leave it on as a mask for fifteen minutes and wash it off for truly healthy looking skin. 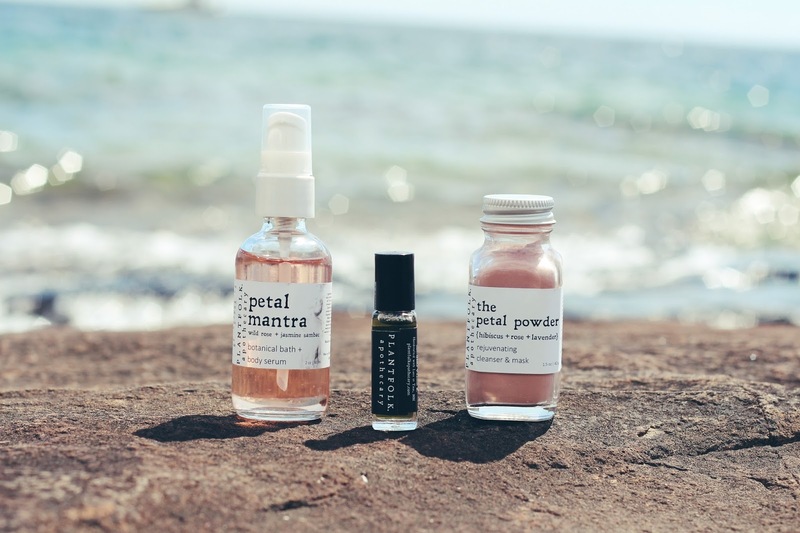 The brand uses the power of flowers again for their beautiful pink Petal Mantra Bath + Body Oil*, a heavenly blend of wild rose and jasmine that will leave your skin supremely hydrated as well as smelling gorgeous. I knew from the get go that I would love this gem for the scent alone, because rose and jasmine are two of my favorite fragrance notes, but I didn't account for how well that actual formula would work to get my skin hydrated and glowing. In fact, the oil is not only great for your body but can actually be used in the bath as well for a seriously relaxing experience. While I haven't had the chance to try that feature out just yet, I've been impressed enough with the body aspect to consider this one a must have. Finally I've been trying out the brand's Dawn Star Under-Eye Elixir*, a blend of thoughtfully picked ingredients that work to brighten dark circles, erase fine lines and all around get the area around your eyes looking healthier and more awake. With ingredients such as blue chamomile, rose, rosehip oil and almond oil, this formula gets straight to work brightening up your skin. The rollerball application makes applying this a breeze, and I often find myself just rolling a bit of this around my eyes, dabbing it in with my fingertips and going on with my day. It absorbs quickly, so it can be used by itself or underneath makeup without any issue. After a month of trialling, I've definitely seen some results around my eyes, which look far less sunken and a bit brighter than before. I'm really excited by the results and cannot wait to keep trying it out further! These are just a handful of the wonderful products that Plantfolk offers, and I'm completely psyched to be able to offer some of these and more when Healuxe finally opens (an update of which is coming to you soon!). In the mean time, be sure to check the brand out on Twitter, Instagram and Facebook to stay up to date with all of their new goodies, or just check out the beautiful pictures they're always posting!